Here’s a look at the upcoming Cryx releases for April. Most of these will be out 4/20, but there are a few coming out in later weeks. 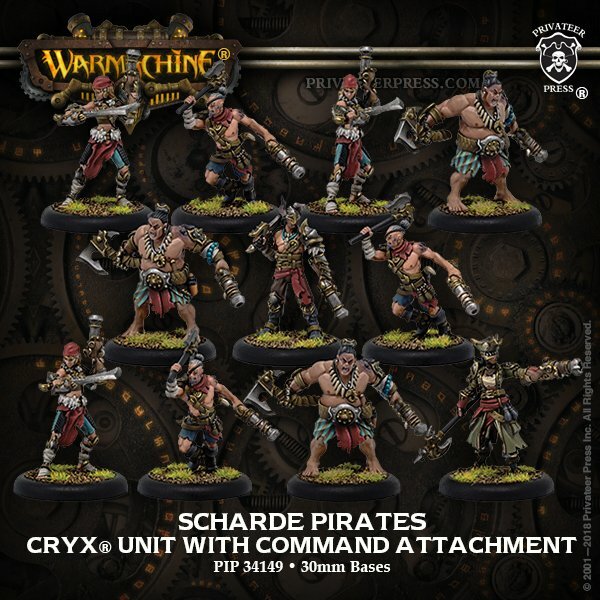 The second half of April is shaping up to be one of the most piratical months for Privateer Press (and that’s saying something). 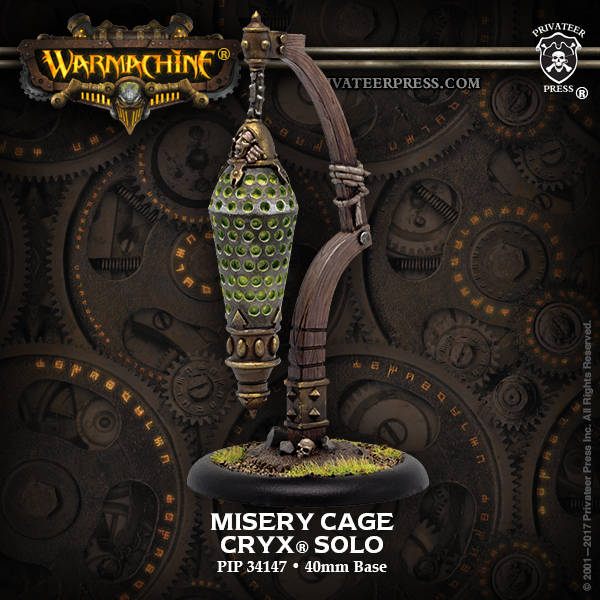 Whether you need Satyxis Solos or Black Ogrun Blasters, you’ll find some cool additions to your Cryx themed forces in the very near future. Check them out! Admiral Axiara Wraithblade is one of the most feared women on the Meredius and oversees countless pirate flotillas from her flagship, the Morbid Angel. Wraithblade earned her moniker from the blood-consecrated sword Anathema she wields. The weapon is a relic of Satyx, purified by blood priestesses in a ritual of carnage to infuse it with occult power. When she cuts enemies down by its edge, the spilled blood allows her to become as insubstantial as smoke, letting her bypass enemy defenses to close on her chosen foe. 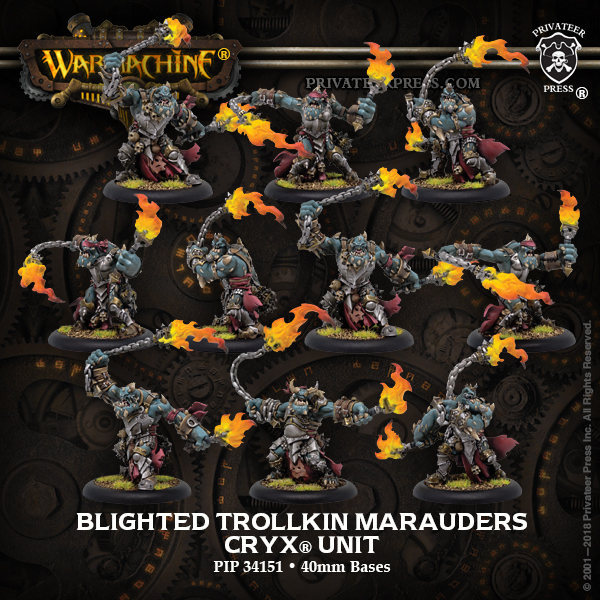 Caring little for their own safety, blighted trollkin marauders swing braziers on long chains that blaze with fire fed by rendered body fat and whale oil. Marauders delight in setting fire to homes in the coastal communities they raid, waiting for the fleeing victims within to rush headlong into their waiting arms. They particularly enjoy the first bite of living flesh that has been blackened and blistered by their torches, and they find the smell of burning meat exquisite. Among those in the Scharde Islands, some humans possess the gift of sorcery, kindled and enhanced by Toruk’s blight. Covens of these women may join the Cryxian pirate fleets, guided by inscrutable omens. Enthralled by the thrumming of blight in their flesh and blood, they indulge in feats of violence, showering in the blood of sacrifices while screaming prayers to the Dragonfather. Some captains feed a coven a steady supply of victims, hoping that amid tortured screams, portents of their future will be revealed. 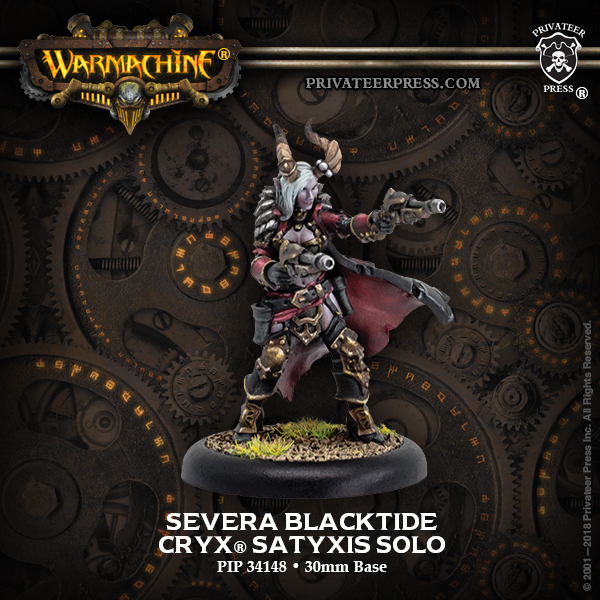 Found in the maelstrom of battle, her laughter punctuated by the crack of her pistols as she sows chaos and death, Severa Blacktide is a legendary Satyxis warrior. Blacktide is the finest Satyxis gunslinger alive and is counted among the premier gun mages in western Immoren. Each bullet through a rival gun mage’s skull or heart serves as another reminder that she has yet to meet her equal and perhaps never will. 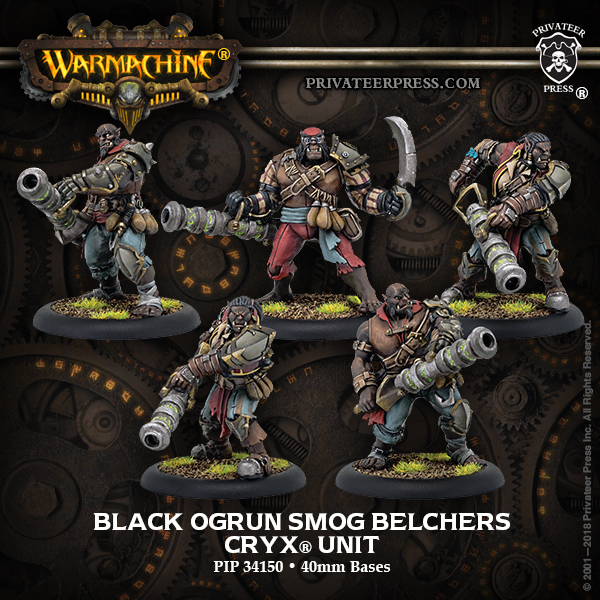 Smog belchers are black ogrun who wield heavy culverin-style cannons. Smog belcher weapons are crafted by skilled ironmongers, black ogrun metalsmiths who fuse their craft with rituals of bloodletting and dark magic. From the deck of a Cryxian vessel, smog belchers lay down a barrage of fire, filling the air with a lingering cloud of corrupting ash that rots flesh and blisters the lungs of anyone who breathes it. Misery cages are a cruel twist on the gibbets used on the mainland to punish pirates. While a mundane gibbet holds a living prisoner to waste away, a misery cage wrings arcane power from the flesh and souls of any locked away within. Cryxians stuff the dead and dying into misery cages so warcasters can draw upon their essence to fuel their profane magic, which renders the body within to crumbling ash, a terrifying but relatively merciful end. Are you ready to loot and plunder?